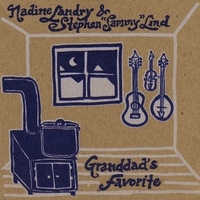 "Granddad's Favorite" is a mixture of traditional old time music, cajun and country songs played and sung by Nadine Landry and Stephen "Sammy" Lind of the Foghorn Stringband on vocals, fiddle, banjo and guitar. I'm a believer! Nadine and Sammy channel the old guys. What a fascinating collection of songs and tunes! And their presentation is so entertaining, done comfortably yet masterfully by this couple. These tracks are either entirely authentic renditions of several genres of North American traditional music, or Nadine and Sammy are master magicians. They suckered me in, that's for sure. Nadine's piercing country voice is perfect for every style she sings here. I believe in her when she's a 19th Century swamp girl singing cajun songs, I believe in her when she charms me with her playful classic country songs. And Sammy, it doesn't matter which instrument he plays here, I get goosebumps with each tune. Sammy defined the Portland fiddle sound twelve or fourteen years ago. He's a rocker who has not just a deep respect for music traditions, but he masters the old music styles that have captured him. Sammy becomes one of the old guys, he's not an interpreter. Its going to be quite a while before this album is matched.